We are ready to ride to Alaska! Okay, we aren’t ready to leave right now, but we are getting there! 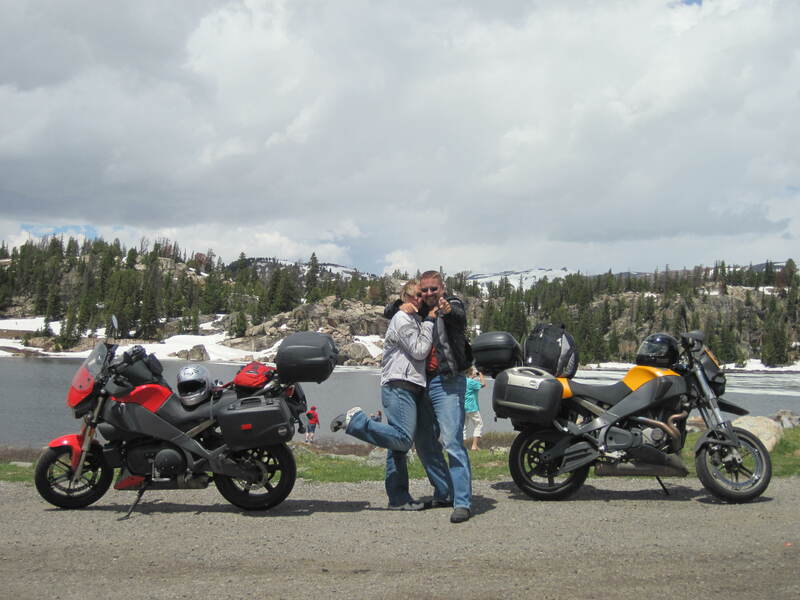 We’ve loved every mile of our trips in the lower 48 states, now we are excited to ride the Buells into Canada & Alaska. We’ve shared previous trips through Facebook, but a journey this spectacular needs a blog. There are a few things you should know about our vacations. We ride & we love it! There are rules we always follow on vacation. 1. Everyone has fun. No matter what the day brings, we embrace the moment & enjoy the experience. 2. No one gets in trouble. For example, if one of us forgets our gear & we have to ride an extra 200 miles to retrieve it, we must refer back to rule #1. No grumpiness, no blaming, no complaining. When we pull out of the driveway on 2 wheels, we set out to enjoy every minute of the time we have together. I have spent hours planning this trip. I have roughly mapped out our route, I have a list of important sites we want to see, a list of supplies we need to bring, and a list of things we have to do before we can leave. We have a giant tote that is filled with supplies we are accumulating. My parents gave us awesome Kelty sleeping bags for Christmas. We put them in the supply box and began adding other items. Shawn has been working on solutions for the tire changes, and a tool kit & spare parts for the bikes. He will get the bikes ready for the trip & hopefully they will safely take us to the Arctic Ocean & back in just 23 days. This trip brings some unique challenges. The temperature difference between regions could be up to an 80’F. We are camping. We’ve never camped & biked before. We will get rained on. This ride is long, about 9,000 miles long. Our biggest trip to date was about 4,200 miles. We will have to change tires along the way. There are stretches of this trip where we won’t have cell service for hours, we will have to carry gas cans. There are 4 planned days where we will ride in the wilderness for over 250 miles & our bikes will only go about 180 miles. We will have to pack food. There are bears. Because we are traveling through Canada, the only protection we will have is mace. That is not comforting. We’ll also meet up with friends for a good portion of this ride, and I am super excited that Daddy has decided to come with us! Safety in numbers! We’ll visit at least 6 national parks including Glaicer, Denali & St. Elias. The route includes dozens of scenic roads. We’ll take the Top of the World Highway, Alaskan Highway, Taylor Highway, Klondike Highway, and many many more. We’ll visit glaciers, provincial parks, old gold mines & the Arctic Ocean at Prudhoe Bay, AK. Save travels. I did the Alaska trip last summer with a friend. It was a complete blast, and believe it or not we had sunshine every day we were on the road. We were very luck with the weather, I wish you the same. Some of the highlights for me was camping on the beach in Homer, the Denali highway ( there is a great spot to camp just east of Canyon Creek, North side of the road), as well as Salmon Glacier in Hyder. Also Thompson’s Eagle Claw Campground in Tok which is tailored to motorcycle travellers was pretty cool. Enjoy!!! Thanks! We aren’t going to make it to Homer on this trip, but we are really excited about Denali Highway & Hyder! Sounds like you had fabulous riding weather! I hope we are as lucky!